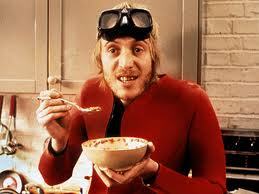 I spend a considerable amount of time "researching" heroes. Too much, some might say, but I feel if you're dedicated to this thing we call 'writing' then you need to show you're serious. 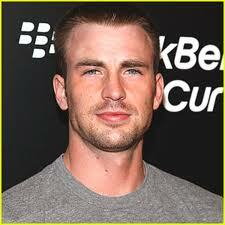 I am so serious about it that I know the difference between Chris Pine and Chris Evans. Trouble is, which one do I like better? What do you think? Too underdressed? Should I put on a tie? 1) If you haven't seen Cellular (thriller with Kim Basinger), then you need to watch it. It was the first movie I'd seen with Chris Evans, and he really held the movie together - which is a big deal when you're a newbie actor. 2) He looks good shirtless. Correction. He looks amazing shirtless. 3) He can do comedy. And when you're in a movie with Anna Faris, you'd better be able to hold your own. 1) He's done a lot of superhero movies over the last few years ... needs to show his romantic side more. My name? Christian. Christian Grey. 1) Even thought I did not like the the movie This Means War, the man knows how to make out! 2) He rocked the James T. Kirk role ... and those were some big William Shatner shoes to fill. 3) He looks amazing in a suit ... which even though is not the same as shirtless, still has its own appeal. 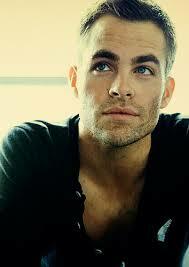 I'm choosing Chris Pine as the winner of this one .. but who would you choose? As some of you might know, I finalled in the 2012 GH contest. I'm still drinking wine to celebrate that achievement (although, I do admit the appropriate celebration time has probably expired). Reading back on my entry, I have to say I still like it. It's a really solid 50 pages. Heck, I would even go as far to say the first 100 are quite good. The other 300 pages though? Pretty much a mess. I did try to edit it .. repeatedly. But after a year of work I finally realized I was doing a lot more work "avoiding" the manuscript than writing it. My house was exeptionally clean during this bleak period ... my toilet gleamed while my writing desk sat and waited for me to find my way back. Even though I wasn't writing, I still wasn't sure if I should quit. Quitting the ms and putting it on the backburner seemed like a bad idea. What about all those agents and editors I met at conference that I promised the manuscript to? What about finishing what I started? What about learning to push through all the tough middle part? And to make matters worse, I'd done this once before with this manuscript. I put it aside once before and worked on something new, only to give up on the new manuscript once I got to the middle. I was afraid I was going to just repeat the same mistake. After much soul-searching at the end of 2012, I finally made the decision to put my GH manuscript on the backburner. I still think it's a good story, but I have lots to do to make it great ... and I decided I needed some distance to get it to greatness. I also decided to work on something brand new that I was excited about. 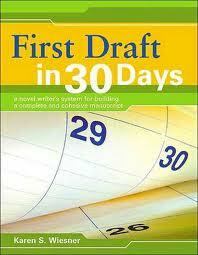 And in order to ensure I don't fall into the same pattern of failure again, I decided to give "First Draft in 30 Days" a go .... try to work out all my plot problems before I write the book so I'm not stuck in the middle wavering. I just finished my outline of my new manuscript. It took longer than 30 days (it took 90 if you want to know the truth) ... but I feel really good about it. I got stuck in many of the same places I did previously, but somehow pushing through an outline is a lot easier than pushing through a half-written novel (go figure). And now I'm onto the scary part. Writing it. I'll be keeping track of my progress on the right rail so you'll all know how I'm doing. Fingers crossed I get through this one! !